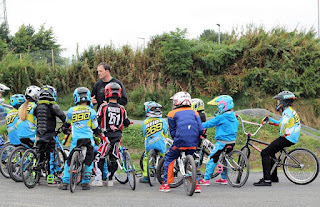 First up was future champs #177 Jamie Harron , #200 Andre Agora and #808 Luke Manton.. Kelvin worked with them on their start gate positioning and hitting the first step up..
Next was Riders #284 Reise , #202 Molly , #770 Lucy , #234 Nicholas , #707 Martin, #909 Ozzy and #269 Luis..
A trip out to the car park for some sprint training was first , then onto the Track for Body Positioning on the gate. Racing Lines were the order of the day , as Kelvin had them tracking in from Lane 8 for perfect track position going into the first berm.. Lastly, Kelvin had them working on the BMX equivalent of 'The Kierin'.. #770 Lucy was setting the pace until the horn blew and the real racing got underway.. This proved to be a very valuable experience, as it got them all racing side by side..
Lastly we had the Seasoned Professionals, #909 Gareth , #272 Stuart and #303 Ian.. Similarly to the previous group , sprints were first then gates.. Racing Lines were next with the Riders pairing up for some inside and outside Berm Action.. Then came the 'Piece De Resistance' .. The BMX Kierin started with #909 Beardy leading the way with the hungry pack of Wolves in toe.. BUT , when the horn blew the Beard turned into the Bullet and left all others trailing in his wake as he flashed over the line..
All in all a Very enjoyable and informative day with a Superb Coach - Kelvin Batey.. Thanks to Lisburn Bmx club and Nathalie from Ratoath Bmx, and of course a big thanks to Kelvin.